Despite the Soviet past, today’s Moscow is a dynamic, cutting-edge city – and the most populous in Europe. Well-heeled Muscovites flaunt their wealth by sipping Champagne with sushi at elite restaurants and shopping for designer labels at frighteningly expensive boutiques. Meanwhile, a growing middle-class has seen a proliferation of hip bars and trendy cultural centres. While the Russian capital has striven to move on, recent tensions with the West have stirred up memories of the past. Moscow has previously led the way with protests against Vladimir Putin, but even with the tumbling ruble and economic sanctions, his popularity remains strong. 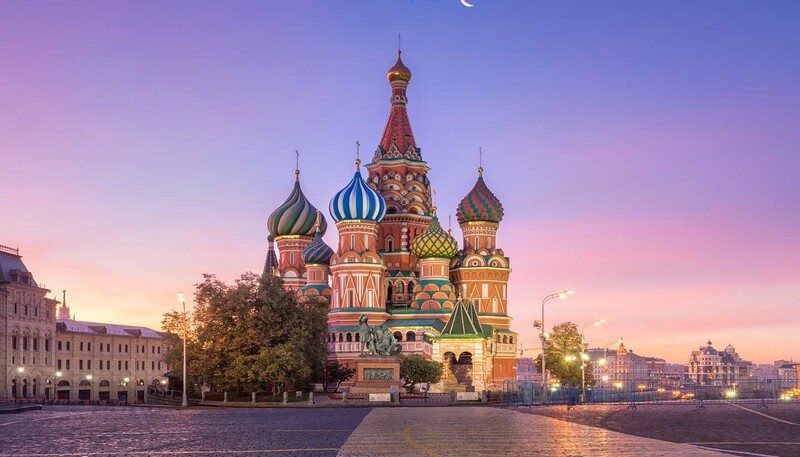 This doesn’t make Russia a no-go area, and Moscow – with its cosmopolitan, globe-trotting denizens – is not the formidable crucible often depicted. In summer, temperatures soar and the city’s vast parklands flourish. The historic Gorky Park received a complete makeover in 2012, installing free Wi-Fi and even a beach, while the Soviet behemoth that was the Rossiya Hotel has been demolished to make way for an ambitious central park. Before that project comes to fruition, there is Red Square to marvel at, not least the mind-boggling St Basil’s Cathedral. Built by Ivan the Terrible in the 16th century, its multi-coloured domes and acid-trip patterns seem to defy logic. Nearby is the 14th-century Kremlin and seat of the tsars. Indeed architecture is one of the city’s main attractions, especially for aficionados of Soviet buildings. All too many have been destroyed to make way for gleaming 21st-century skyscrapers, but Stalin’s unmistakable Seven Sisters still stand tall against the modern towers. The city is naturally keen to celebrate its great writers, composers and artists too. This sophisticated city boasts world-class institutions like the Bolshoi Theatre, the Moscow Tchaikovsky Conservatory and the Pushkin Museum of Fine Arts. As for nightlife, the city is becoming increasingly hedonistic – whether jazz, rock or vodka is your thing, there are plenty of options. Even the culinary circuit has come on leaps and bounds, though an evening at one of the city’s growing stable of world-class restaurants requires considerable investment. This is, after all, a capital of oligarchs.